Super Bowl 2018 - How do NFL audiences interact with their favourite brands? With an estimated 110 million people in the USA alone tune in to watch Super Bowl LII, advertisers including Budweiser, Hyundai and Amazon have already begun to build excitement surrounding their $5million per 30-second TV commercials. With brands investing such a significant sum of money for an ever-decreasing attention share, there’s never been a more important time for brands to utilise Audience Intelligence to ensure their campaign’s narrative and themes appeal to their target audience’s preferences, habits and motivations. In this post, we’ve used data from Global Web Index to identify where the opportunities might be for brands looking to target USA based fans of the NFL, plus fans of the two Super Bowl LII teams; the New England Patriots and the Philadelphia Eagles. For the purpose of this post, we’re looking at fans aged 35 – 44. This was chosen based on Global Web Index data which shows the majority of NFL Fans in the USA are in this age group. Understanding how a target audience are most likely to find out about new brands, products, or services is a vital insight for brands, to ensure their campaign is visible to their target audience in the most effective and efficient way possible. · Compared to global internet users, USA based NFL fans are 61.9% more likely to discover a new brand, product or service through an advertisement heard on the radio, followed by in-store product displays or promotions and adverts seen on TV. 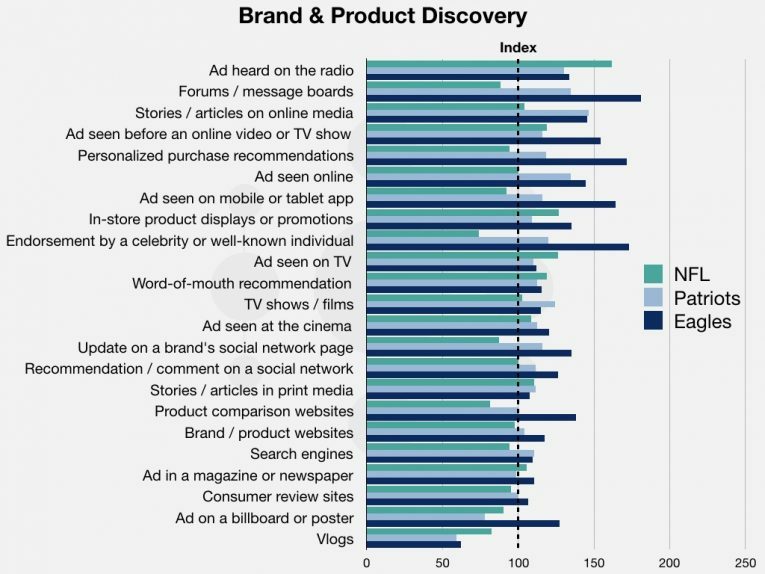 · Fans of the Eagles are most likely to discover a new brand, product or service following an endorsement by a celebrity or well-known individual. · NFL fans are 61% more likely than the average internet user to want their favorite brand to make them feel like a valued customer, followed by using materials and services from local suppliers, and donating to and supporting charities. 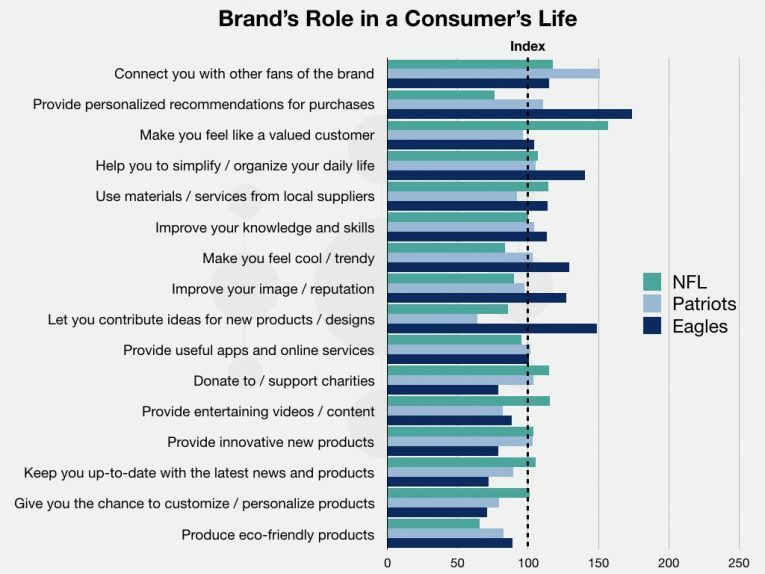 · The Eagles fans are more likely than the average NFL fan to want their favorite brand to provide personalized recommendations for purchases, with allowing the consumer to contribute ideas for new product also being an important factor. · However, the Patriot fans are 50.8% more likely than the average NFL fan to want their favorite brand to connect them with other fans of the brand. · Interestingly, providing useful apps and online services would be the most effective strategy for the highest 10% earning fans of the Patriots. · While the most effective strategy to appeal to Eagles’ top 10% of income earners would be to improve their knowledge and skills. With the likes of Mountain Dew, Lexus and Amazon Alexa expected to be appearing in the commercial breaks on Sunday, below we look to identify which drink, automotive, and technology brands resonate with each audience group the most. · Whereas the Patriots and Eagles fans are far more likely to drink Pepsi Max on a weekly basis than the average NFL fan. Which is no doubt welcome news for the title sponsor of the Halftime Show. · With a third of internet users discovering brands via word-of-mouth recommendations, utilising brand advocates should be a key part of any automotive marketing strategy. · Analysis of the NFL audience shows that they are more likely to own or have previously owned an Infiniti or a Jeep, and are also far more likely to recommend or post a review of these two automotive brands. · Looking at the Eagles fans, they are more likely than the average NFL fan to own and recommend a Land Rover, with Patriots fans more likely to own and recommend a Jeep. 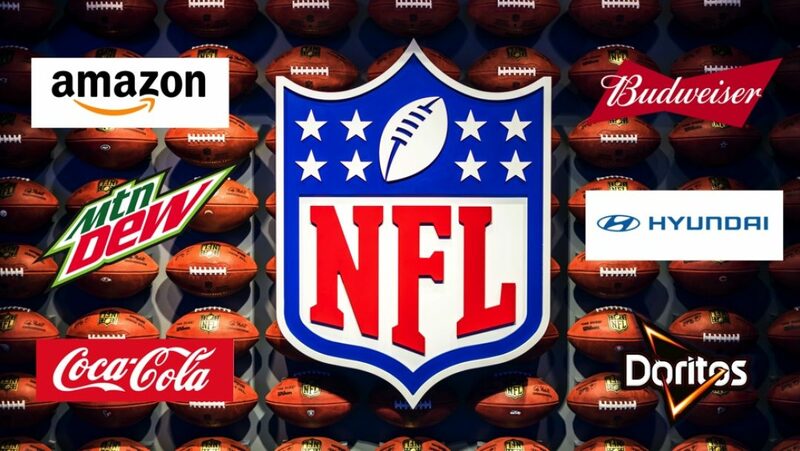 · Like Automotive and Drink brands, Technology brands have long been associated with Super Bowl commercials with Amazon, Google, Intel and Nintendo all expected to return to this year’s event. · Drilling down into brand advocacy behaviors of NFL fans, we see that almost 40% of NFL fans would recommend Samsung to their family and friends, with slightly less (32%) recommending Apple. When looking at the Patriots and Eagles fans, they are more likely that other NFL fans to advocate Huawei to their family and friends. Being able to identify and act upon useful aspects of an audience, such as their demographic, interests, location, and consumer behaviours, provides brands with the knowledge that can shape their marketing strategy to ensure it speaks directly to their target audience. While the volume of content being produced for online and social media audiences is growing at a significant rate, the time online users have to view and engage with this content isn’t, meaning the need for the most impactful marketing content has never been more important.